Detectives investigating the attempted murder of a police officer at a filling station on the Crumlin Road in Belfast on Sunday 22 January have made two arrests. 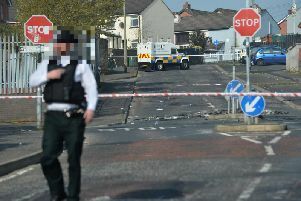 The men, aged 18 and 33, were arrested this morning in the west Belfast area and have been taken to the Serious Crime Suite at Musgrave Police Station for questioning. At around 7.30pm on January 22 a community police officer sustained two bullet wounds to his arm after a number of shots were fired at him at a filling station on the Crumlin Road. Detectives continue to appeal to anyone who has any information that could help their investigation to contact detectives by calling 101. Information can also be passed anonymously via the independent charity Crimestoppers on 0800 555 111.